The fastest and most protected course for vessels making their way north to the Straits from the southern shores if Lake Michigan was through the natural channel between the Manitou and Beaver islands and the mainland along Lake Michigan's eastern shore, known as the Manitou Passage. To mark the western entry to the passage, the Fifth Auditor of the Treasury had established a lighthouse on the southern tip of South Manitou Island in 1840. However, by the early 1850's, no steps had been taken to mark the passage's eastern side. Assuming responsibility for the nation's aids to navigation in 1853, the newly formed Lighthouse Board quickly sought to rectify this oversight. Noting that vessels making for the passage used a natural point on the mainland 20 miles southeast of South Manitou known as Point Betsey as a marker to begin their northeasterly turn into the passage, the lighthouse Board recommended that an appropriation of $5,000 be made to fund the construction of a lighthouse on Point Betsey in its first annual report to Congress. Congress appropriated the requested funds on March 3, 1853, and President Franklin Pierce ordered the purchase of a ten acre reservation on the barren dunes on April 4 of that same year. With the process of obtaining clear title to the land underway, a contract was awarded for the station's construction, and plans were put in place to begin construction on the opening of navigation the following year. While the contractor was reported to be on the site in 1854, for reasons yet to be determined, construction of the station was not completed until 1858. The plan for the Point Betsey Light called for a cylindrical single-walled tower constructed of Cream City brick, standing 37 feet in height from the foundation to the top of the ventilator ball. Five concentric brick rings encircling the tower beneath the lantern, each successively larger in diameter than the lower ring, formed a support for the gallery on which an decagonal cast iron lantern was installed. The lantern was outfitted with a white Fourth Order Fresnel lens equipped with bulls eyes, which was rotated around the lamp by a clockwork drive at a precisely monitored speed to impart the station's characteristic fixed white light with a flash every 90 seconds. By virtue of the tower's location on the dune, the lens was located at a focal plane of 52 feet above lake level with a range of visibility of ten miles. The small two story dwelling, also of Cream City brick was located on an excavated cellar immediately inshore of the tower, to which it was connected by a short covered passageway. This passageway was outfitted with a cast iron door at the tower end in order to stop the spread of any possible fire between the two structures. The exact date on which the Point Betsey Light was exhibited has been lost to history. While Lighthouse Board annual reports and Light Lists report the station as being completed in 1858, it was not until February 1, 1859 that David Flury, the first keeper to be assigned to the station, appears in District payroll. Thus, it may well be that while construction was completed in 1858, the Light was not activated until the opening of the 1859 navigation season. After only a year of operation, the tower's location on the dune a scant few feet back from the waters edge was found to be causing a problem that would plague the station throughout the ensuing years. It was found that waves crashing against the base of the dune were undermining the dune itself, and had displaced some of the foundation stones on which the tower was erected, thereby threatening the very stability of the tower itself. To stem the erosion, in 1869 a timber protection was installed at the base of the dune, and the foundation stones moved back into position and reinforced with concrete. At this time, the dwelling roof was also replaced to stem seepage which had caused large portions of plasterwork to fall and the hardwood floors to buckle and decay. With a general expansion of the service throughout the lakes, the Point Betsey Life Saving Station was erected at a cost of $3,000 to the immediate south of the lighthouse reservation in 1875 under the stewardship of Keeper Thomas Matthews. 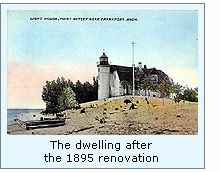 With an increasing volume of maritime traffic making for the Straits from the growing cities on Lake Michigan's southern shores, the Lighthouse Board recommended in its 1880 annual report to Congress that the sum of $40.000 be appropriated to replace the diminutive tower and deteriorating dwelling with a structure at least 100 feet in height, equipped with a Third Order Fresnel lens to more effectively mark this critical southern turning point into the Manitou Passage. While the Board would reiterate the request on an annual basis over the following decade, Congress never allocated the funds, and plans for the replacement were eventually abandoned, and the District turned its focus to a less costly alternate solution to the long term survival of the station. To this end, Ninth District Engineer Major William Ludlow ordered a thorough engineering inspection of the station in 1889. While Ludlow found moisture in the tower as a result of its single-walled construction, he found the tower brickwork itself to be structurally sound. However, the condition of the tower foundation was found to be in an extremely precarious condition due to its shallow depth, and the continued undermining of the sand. To strengthen the foundation, the tower was blocked, the surrounding sand removed, and a tapered concrete ring sixteen feet in diameter at the base, twelve feet in diameter at the top with an inside opening of four feet in diameter was inserted in sections beneath the tower. The inner cavity of this ring was then filled with cement up to the first floor level to lock the foundation ring to the tower, and covered with a brick veneer to serve as a durable floor within the tower. In an attempt to prevent further foundation erosion, a contractor arrived at the station on April 17, 1890 and began driving timber pilings at the water's edge in order to construct a curved revetment some 240 feet in length at the base of the dune. The pile-driving was completed the following month, and the dune above the revetment was covered with a facing of 3" by 12" planks with 2" spaces between, and the entire structure filled with crushed stone to both offer support to the revetment and to absorb the energy of waves passing through the openings in the plank facing. From the face of this revetment, two fifty foot long timber jetties, fourteen feet in width and also filled with stone, protruded into the lake in order to dissipate the energy of waves traveling diagonally across the shoreline. With the stabilization project complete, the Lighthouse Board turned its attention to the periods of thick weather which enveloped the point, requesting an appropriation of $5,000 for the construction of a first class fog signal building at the station in its annual report to Congress for fiscal 1890. Congress appropriated the requested funds on March 31, 1891, and the Ninth District office responded quickly, issuing a contract for the fabrication of the machinery on June 23. Work at the station began soon thereafter with the construction of a 22 foot by 40 foot fog signal building approximately 120 feet to the north of the lighthouse. A timber-framed building, its exterior was sheathed in corrugated iron, and its interior walls covered with smooth iron sheets. On concrete foundations within the building, the duplicate steam engines equipped with 10-inch steam whistles were erected and supplied with water from a brick curbed well dug beside the building. Work on the building was completed, and the machinery tested successfully on December 22, and the new signals placed into operation during a snowstorm on December 22, 1891. With the increase in workload represented by the fog signal, an the addition of an Assistant was approved for the station. Charles W. Butler was appointed to the position, moving into the small dwelling with Keeper Peter Dues and his family on February 25, 1892. On April 23, Mr. Crump the District Lampist arrived at the station and installed a new Fourth Order Fresnel lens, changing the characteristic from fixed white varied by a white flash every 90 seconds to flashing white every ten seconds. Also this year, a work crew arrived at the station with the components of a prefabricated circular cast iron oil storage building, which was erected a short distance behind the fog signal building. The crew also poured a concrete floor in the cellar, and installed 530 feet of plank walks from the dwelling and around the fog signal building. It soon became clear that the small dwelling was insufficient for two families, and in 1895 a work crew arrived at the station to undertake a complete renovation and enlargement of the structure. In order to convert the structure into a duplex dwelling, the building was enlarged in both width and length through the addition of six rooms and a rear addition, and the hip roof replaced by one of gambrel design. Also at this time, the station barn was completely rebuilt and the fog signal machinery overhauled. 1895 was also memorable for Head Keeper Soren Christianson and Assistant Medad Spencer, for in this year they were kept busy feeding the hungry boilers to keep the fog signal actively screaming for a station high 1,312 hours. Doubtless Christianson looked forward to the relative peace and quiet of Chambers Island when he accepted a transfer to that station at the end of the season on November 13. In order to make the structures more visible against the dunes and trees during daylight hours, and thus serve more effectively as a daymark to mariners offshore, both the tower and dwelling were painted white, and the roofs painted bright red in 1900. With the turn of the century, for some reason the spelling of the name of the area changed to "Point Betsie," with the name of the station being spelled in that manner for the first time in the Lighthouse Board annual reports for fiscal 1902. The keepers settled into a relatively uneventful decade, with no major construction or renovation projects undertaken on the Point. This relative peace was interrupted in the fall of 1912, when a work crew arrived on the point to completely rebuild the fog signal building and to replace the 10-inch locomotive whistles with 10-inch chime whistles, which were placed into operation on October 1. On October 1 of the following year the lamp was upgraded to an incandescent oil vapor system, with a resulting increase in intensity to 55,000 candlepower. With the extension of electric power lines into the area in 1921, arrangements were made to hook the station into the power grid, and a 110-volt electric bulb was installed in the lens, and the fog signal again upgraded to twin Type "G" diaphones, powered by a pair of electrically driven air compressors. The Type "G" diaphone represented a significant improvement, since their audible radius was almost double that of previous systems, and their electric power allowed them to be sounded almost immediately when needed, as opposed to waiting for the steam engines to build sufficient pressure to operate. To better take advantage of the inherent capabilities of the diaphone, the fog signal's characteristic was changed on April 1 of the following year to a group of two blasts every 30 seconds. 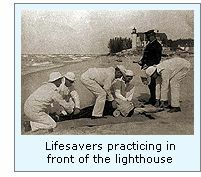 With the dissolution of the Lighthouse Service in 1939, and responsibility for the nation's aids to navigation transferred to the Coast Guard, in order to decrease operating costs a renewed emphasis was placed on automation and the reduction of staffing levels. To this end, the position of Second Assistant was eliminated at Point Betsie, with Nels A. Nelson being the last man to serve in the position on his retirement from service in 1940. 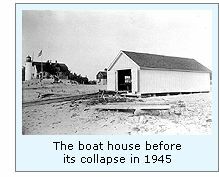 Around this time, the station boathouse collapsed, leaving nothing but the stone foundation remaining on the shore. The lens clockwork was removed from the tower in 1944, and an electric motor installed to rotate the venerable Fresnel lens. No longer serving any Government purpose, the remaining Point Betsey Life Saving Station buildings was sold into private ownership in 1945. In 1952, the station's First Assistant Keeper Louis S. Bauchan retired from lighthouse service. Born in 1912, Louis entered lighthouse service in 1936, serving at Chicago Harbor, Pilot Island, St. Martin Island and Poverty Island before transferring to Betsie in 1947. Thus, Louis was the last of the old Lighthouse Service civilian "Wickies" to serve at Point Betsie, and with his departure a historic era came to a close. 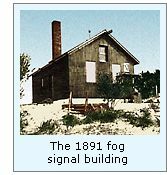 While automation had virtually eliminated the need for keepers at Point Betsie, the dwelling continued to see use as housing for seamen stationed at Coast Guard Station Frankfort, and with the building thus occupied, the final steps to automation were not taken until 1984, when the station took the honor of being the last light station on the Great Lakes to be completely automated. The Fourth Order lens, which had served at the station for 104 years was removed from the tower in 1996 and replaced with a Vega VRB-25 250 mm acrylic optic. The old lens was carefully moved to the Sleeping Bear National Lakeshore Park headquarters building, where it was placed on display and where it may be seen to this day. The Coast Guard relocated the final personnel from the lighthouse to Station Frankfort in 1996, and after 138 years of faithful service to mariners, the Point Betsie Light was locked-up and left to face the elements alone. The Ninth District Office in Cleveland officially considered the property as "excess" and turned the station over to the Bureau of Land Management for liquidation. The station was transferred to Benzie County through the auspices of the National Historic Lighthouse Preservation Act in 2004. The grass-roots group Friends of Point Betsie Lighthouse immediately embarked on a complete restoration of the station. Click Here to see a complete listing of all Point Betsie Light keepers compiled by Phyllis L. Tag of Great Lakes Lighthouse Research. Take M22 North around Crystal Lake, which you will see on the East side of the road. Approximately 5 1/2 miles North of the junction of M22 and M115, Point Betsie Rd. intersects from the West. Turn onto Point Betsie Rd. and drive approximately 1 mile to the lakeshore. The road widens at the beach, and affords a few parking spaces. The Lighthouse is on the North side of the road. Historic image from USCG Historians office, Photographic archives.